PTLI Sheep joins Pittsfield flock. PTLI is one of the proud sponsors of Sheeptacular, a community arts project designed to stimulate creative expression, while attracting visitors to the city center. SHEEPTACULAR PITTSFIELD! will transform the streetscape of the City of Pittsfield, MA into a playground with artist-decorated Merino sheep for the residents of the City and for the flocks of tourists in the summer of 2004. The oversized fiberglass models will celebrate the shear creativity of our local arts community, recalling the historic Merino sheep whose sheared flocks fueled Pittsfield's vigorous woolen industry in the 1800s. Merino sheep are still seen today at Hancock Shaker Village. 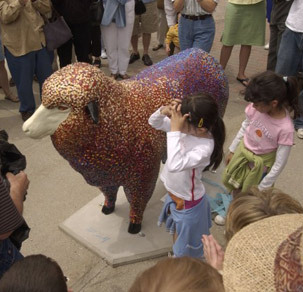 "Shimmering Sheep" by artist David Ricci, sponsored by Plastics Technology Laboratories, Inc.
Click here to visit the Sheeptacular site.